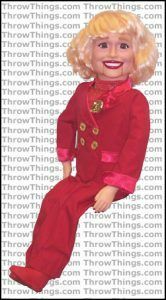 If you are looking for premium quality, all-in-one female ventriloquist doll, look no further and make sure to check out my Carol Channing ventriloquist dummy review! Carol Channing was an American actress, singer, comedian, voice artist and dancer who starred in movies, Broadway shows and TV far over three decades. Ventriloquism is one of the fastest growing sectors of the entertainment industry, and what’s notable is the relatively high number of people are looking to become a ventriloquist. This article will show you, why using famous female ventriloquist dummies such as Carol Channing can be a distinct advantage. 3.1 Suppose if Carol could move her head and mouth? 3.2 What about if Carol’s lovely hair looked more realistic and vibrant? 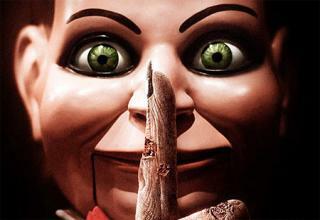 4.1 But Carol had lovely big eyes – how are these represented in a ventriloquist puppet? 6 But what if all of the above features isn’t enough? 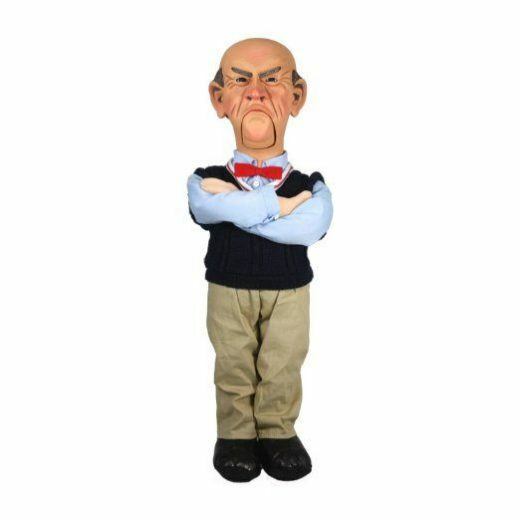 7 But aren’t celebrity ventriloquist puppets expensive? 8 So what are you waiting for? With the Carol Channing ventriloquist dummy, the audience will love how the doll perfectly recreates all the attributes that made Carol Channing so beloved. With her easily recognisable (and imitated) voice, her enthusiastic expressions and vibrant character, Carol Channing makes the perfect subject for a female ventriloquist puppet. Don’t believe ventriloquist dummies can be so interesting? With a ventriloquist dummy that so faithfully replicates a real star like Carol Channing, your audience will know you mean business with your act. 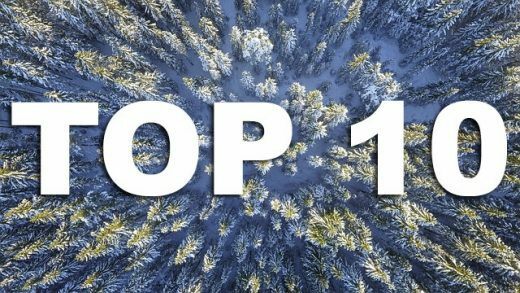 Want to know how you can actually really connect with your audience? Keep them engaged with lots of little things they will notice about your Carol Channing ventriloquist dummy. In addition to the basic Carol Channing ventriloquist dummy, there are several feature-packed upgrades that will add massive value to your act and keep the audience engaged. Suppose if Carol could move her head and mouth? With a hard hollow body and a fully movable head, the standard upgrade dummy brings more features without sacrificing controllability. Carol’s mouth is moved using the control stick, and is still easily operated whilst seated and with one hand. What about if Carol’s lovely hair looked more realistic and vibrant? With the deluxe upgrade, the Carol Channing ventriloquist doll is elegantly styled with a shiny, exuberant wig that perfectly reflects her famed lovely head of hair. What audience wouldn’t notice the attention to detail your ventriloquist puppet reflects, which in turn will only impress them more with your commitment to your act. But Carol had lovely big eyes – how are these represented in a ventriloquist puppet? 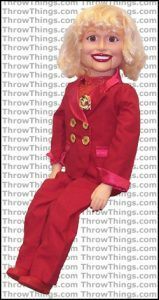 If you were serious enough about ventriloquism to invest in a super deluxe upgrade, your Carol Channing ventriloquist doll would have moveable eyes and eyebrows also. Audiences will be able to follow Carol’s famous big blue eyes and surely be drawn into your act even more. But what if all of the above features isn’t enough? To protect your ventriloquist puppet when moving between venues, a vinyl carrying bag is provided to help you keep Carol clean and safe (only comes with the basic version). To help you learn the art of ventriloquism, an extremely useful booklet called “Seven Simple Steps to Ventriloquism” is also provided. 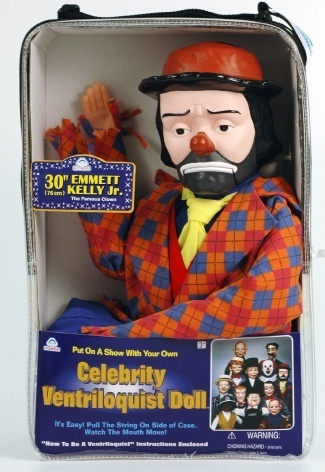 But aren’t celebrity ventriloquist puppets expensive? Whilst it’s true that there are cheaper ventriloquist puppets about there, that’s not all…. Rather than think about cost, consider the value. By having a famous female comedian like Carol Channing in your ventriloquist act, it shows you are serious. By having a celebrity ventriloquist puppet in your act, it will bring challenge to you to develop all aspects of your skills to match her performance to your crowd. Imagine if can perfectly reproduce her famous voice, how much better will your act be? As we’ve already listed above, there are many benefits that a female comedian ventriloquist puppet such as Carol Channing will help connect with the audience – especially a predominantly female one. 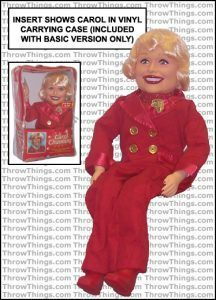 Which of one of the four Carol Channing ventriloquist dolls will you be buying? Make today the day your ventriloquist career really takes off!